With the nation snared in what the government says is the worst drug epidemic in its history, routine autopsies, which take more than two hours, are overtaxing medical examiners everywhere. 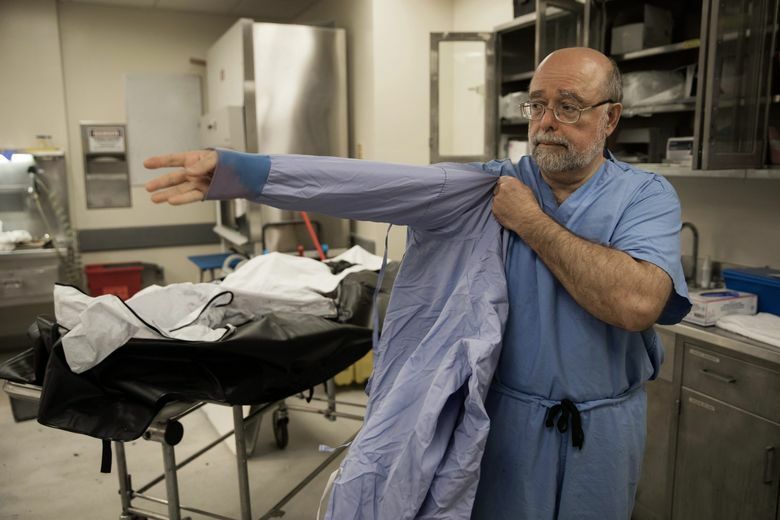 In the state morgue in Concord, in the industrial maze of a hospital basement, Dr. Thomas A. Andrew was slicing through the lung of a 36-year-old woman when white foam seeped onto the autopsy table. Foam in the lungs is a sign of acute intoxication caused by an opioid. So is a swollen brain, which she also had. But Andrew, the chief medical examiner of New Hampshire, would not be certain of the cause of death until he could rule out other causes, like a brain aneurysm or foul play, and until after the woman’s blood tests had come back. As Andrew, 60, has watched the drug toll mount, he is no longer content simply to catalog it. He wants to try, in his own small way, to stop it. After laboring as the chief forensic pathologist for two decades, exploring the mysteries of the dead, he retired last month to explore the mysteries of the soul. In a sharp career turn, he is entering a seminary program to pursue a divinity degree, and ultimately plans to minister to young people to stay away from drugs. With 64,000 overdose deaths last year nationwide — a 22 percent jump over the previous year — it is little wonder that overdoses, the leading cause of death among Americans younger than 50, are reducing life expectancy. They are also straining the staffs and resources of morgues, and causing major backlogs. This is especially true in New Hampshire, which has more deaths per capita from synthetic opioids like fentanyl than any other state. Last year the overdose-death toll reached nearly 500, almost 10 times the number in 2000. In Milwaukee, Dr. Brian L. Peterson, the chief medical examiner, said apart from the “tsunami” of bodies — his autopsy volume is up 12 percent from last year — the national drug crisis has led to staff burnout, drained budgets and threats to the accreditation of many offices because they have to perform more autopsies than industry standards allow. At the same time, severe staff shortages unrelated to the drug crisis are crippling the profession, said Peterson, president of the National Association of Medical Examiners, which oversees accreditation. Few people go into forensic pathology in the first place, he said, largely because of low salaries, and as more forensic pathologists retire, fewer are replenishing the supply. The result, Peterson said, is a national crisis that has cost at least four offices their accreditation, which can undermine public confidence and lead to court challenges over a medical examiner’s findings. For Andrew in New Hampshire, where a backlog of autopsies has put the state at risk of losing accreditation, that prospect is particularly distressing. He spent the first eight of his 20 years professionalizing the office and earning its accreditation. Despite the caseload, the office has one of the most timely and transparent surveillance and reporting systems in the country. A medical examiner’s office is considered deficient if an individual pathologist must perform more than 250 autopsies per year. Last year, Andrew and Dr. Jennie V. Duval, the deputy chief medical examiner, performed 250 each. If this year’s number exceeds last year’s, New Hampshire could be in trouble. Pathologists cannot refuse to do autopsies just because they might risk losing accreditation. Nor would Andrew rush through them, he said, even if all signs pointed to a drug overdose. Since the overdose toll began to climb about six years ago, Andrew has pleaded for more pathologists. The Legislature authorized one in July, but until then, his office had only two, the same number as when he started, in 1997. He pulled out a logbook going back to 1997, when his entries began charting the earliest stages of what would become the drug epidemic. “There’s a blunt impact, a drowning, one drug overdose,” he said, scanning an early page. A few years on, he found seven overdoses on a single page. A more recent page: 12 overdoses. Most were caused by fentanyl, which by now has so thoroughly replaced heroin as the biggest killer on the streets that the state no longer talks of a heroin epidemic but a fentanyl one. The logbook also revealed that drug users in their 20s and 30s are increasingly dying of heart-valve infections, known as endocarditis. The ages are young for such infections; in these cases, they result from dirty needles. “We have seen more endocarditis in the last two years than we have in the previous 15 combined,” Andrew said. The arrival in May in New Hampshire of carfentanil — the elephant tranquilizer that is 10,000 times as potent as morphine — has also ratcheted up pressure on his office. This year, New Hampshire has had 41 suspected carfentanil deaths, 11 of them confirmed, far more than most states. His plan is to become an ordained deacon in the United Methodist Church, with two goals: to serve as a chaplain for the Boy Scouts of America, and to join the Appalachian Trail Chaplaincy of the United Methodist Church so he can minister to troubled hikers, at least on the 161 miles of the storied trail that cross New Hampshire and its White Mountains. For him, there is comfort in the concept of an afterlife.